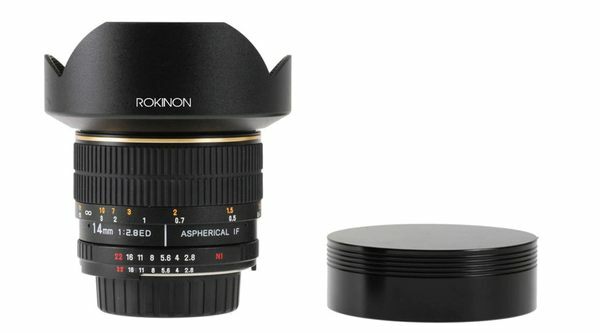 Rokinon 14mm F/2.8 lens for Sony. A new arrival at B&H Photo is the full frame or APS-C Rokinon 14mm F/2.8 lens for Sony, I thought it would be labeled a Vivitar or Bower, oh well. The pictures show either a Nikon or Canon mount, but the link is for a Sony. This is a manually operated lens, meaning there is no communication between it and the camera. I wonder if it has a gel slot in the back as there is no way to mount filters on the front. I'll probably review one in the future. Shoot RAW for better color and detail. Most people don't care about white balance adjustments, smooth color transitions and preserving detail in their images, they just use the auto setting, and forget it. That's fine for snap shot artists, but people that want to take their photography to the next level should be aware of what can go wrong when shooting in jpeg, problems that develop when using the wrong white balance setting, and how to avoid these mistakes all together. Check out this quick and simple article on color issues using different image quality formats. Additionally, at the bottom of the page is a resolution comparison between a jpeg and RAW image on the Sony A580; it's the same set I used on the homepage last month. The two cropped samples below show what happens when you shoot jpegs with the wrong white balance setting, and then try to adjust your way out of it. I know this because I used to do it. Back when I first started shooting digital, I didn't bother to try and educate myself on the importance of shooting in RAW, especially concerning color balance and correction. Back in the olden days of digital photography, let's say five years ago, large file sizes from saving in RAW required expensive memory cards, that was my problem, or excuse. Today, that shouldn't be a concern as adequate memory cards are cheap, (like this $44.95 16GB Sony Memory Stick Pro HG DUO). As widely reported, the A850 full frame camera has been discontinued by Sony. This means Sony has only one pro, and no intermediate level cameras for sale right now, it's certainly something I would not have believed back in 2007 when I bought the great A700. Hopefully, Sony will roll out the A700 replacement soon. Back in 2008 people thought I made a radical, (and stupid) prediction that the A900 would still be one of Sony's top-line cameras five years after its introduction. Well, it's been available almost three years now, and it doesn't look like a replacement is in the works until at least 2012, so that'll be four years as Sony's top-line camera. The replacement will probably follow the SLT commitment by Sony and drop the brilliant A900 viewfinder for an inferior electronic type. For those of you that say it doesn't matter, try looking through the A900 viewfinder with a fast lens, and then through an SLT with EV, there's a huge difference, especially in harsh or low light. Outdoors, I use the A580's optical finder instead of live view. So it looks like my 2008 prediction will be a little off, I'd say now that the A900 will have a high value lifespan of far more than five years. Sure, the coming years will produce better high ISOs, cleaner video, faster shooting speeds and unfortunately even flatter HDR images using dozens of shots, however, if your goal is pure image quality, the A900 is still the best Sony has to offer. Sigma 50mm F/1.4 HSM review. The Sigma 50mm F/1.4 EX DG HSM lens was introduced a couple of years ago, along with a lot of media hype. Sigma went all out and produced a fast standard prime lens which is optimized for center sharpness at F/1.4, (in my opinion) and it delivers the goods, as it is amazingly sharp in the centers at F/1.4, especially when used on a full frame camera. This lens is big, heavy and expensive, much more so than other equivalent makes and models, including the Sony 50mm F/1.4. If you want to see some comparisons between these two lenses, scroll down to the "bonus section" at the bottom of the review page. APS-C and landscape shooters be sure and read the conclusion, as I have some alternatives for you. Check out the Sigma 50mm F/1.4 review. I almost have the Sigma 50mm F/1.4 HSM review done, it's taking longer than expected as I've been super busy this last week or two with miscellaneous photo jobs. I can say so far it's living up to the hype. The next accessory review will be the Manfrotto 058B tripod with 222 joystick head. This is a big and heavy tripod, so it's not for everyone, but it does allow very easy set-up from shot-to-shot, I bought this combo a year or two ago for that reason. Also look for a quick review of two wireless shutter releases, the feature loaded Pearstone shutterboss and a simple but inexpensive Vivitar model. Since there isn't anything else worth reporting on right now, I thought I'd post another A700/sigma 10-20mm photo. This outdoor residential curbside view is a result of a mistake. I was photographing the interior of this house with all the flashes set up in the room behind the front doors and hallway to the right, and decided to do a quick check outside to see how the light was shaping up for the twilight shot that was to come after I was done with the interior. Once I saw the light color and the reflections off the windows, I decided it was a great time to fire off a couple of shots in case I should happen to screw up the twilight shot! I forgot to turn off the flash trigger, and the result of the flashes kicking inside made for some nice window lighting from my position. Normally at this time, I would've been ready to start setting up for the outside shoot, but I decided I liked this image, and then worked the back pool area for the wrap-up. There were no flashes outside, but I could've used two or three on the right side of the image to highlight that part of the house and landscaping. I only had enough flashes at the time to do either the interior or exterior, not both at the same time, so there was no option for a perfect shot, at least what I thought would've been a perfect shot. The left side entry light is burned out(!) so the light in the entryway isn't symmetrical, but oh well, maybe I'll remember to check the bulbs earlier next time. 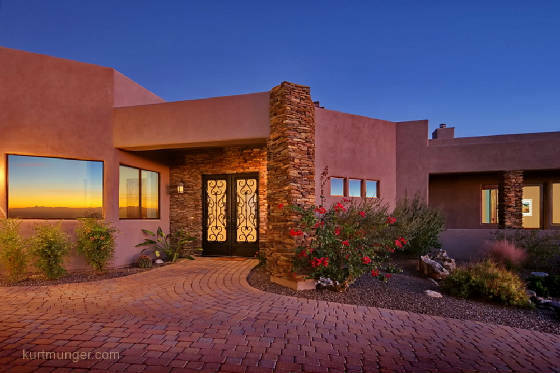 I think I had about three flashes when I took this image, which is ok for smaller homes, but you really need six or more when doing one-shot interior/exterior photography of larger homes with nice landscaping and pool areas. I'm not sure what the specs are for this photo because I don't have the original file handy (and exif data), but I believe the focal length is 12mm, ISO 200 at about 4sec, F/7.1. Sony CLM-V55 monitor quick review. Did you ever wish you could have a better, and bigger main LCD on your camera, one that makes it easier to focus and compose on? The Sony CLM-V55 is one such product. This screen is great for old folks that can't see too well anymore, or anybody else that has problems seeing the standard 2.5" or 3" camera LCDs. Even if your current camera screen is VGA quality, like most Sony DSLR, SLT and NEX cameras screens are now, the Sony 5.0" portable monitor is a big step up. You don't need to have a Sony camera to use this item, any camera or camcorder that supports HDMI output will work. Thoughts from my somewhat limited use on still cameras only; for cameras without live view and video, like the A700/900 etc---still worth a hard look. 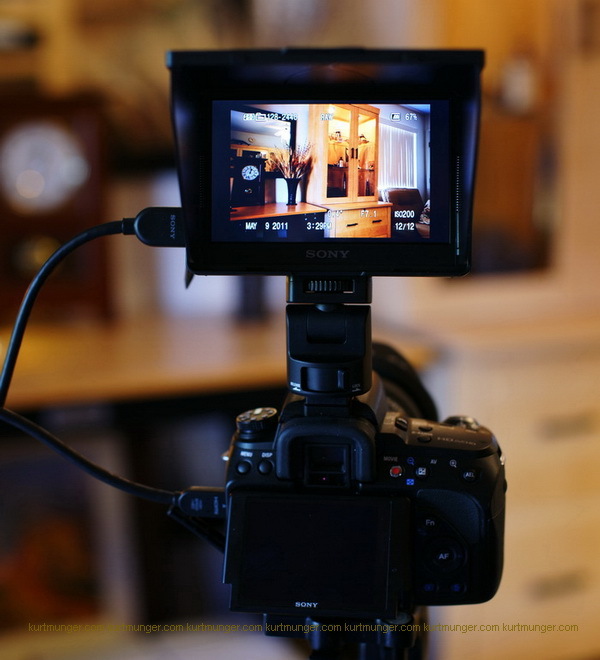 If you have trouble seeing everything in the camera screen, or your camera screen doesn't tilt or swivel, this LCD would solve those problems. For live view cameras with tilt screens; it would be a nice accessory as you can see the focus point much easier, and shooting and watching video is more enjoyable. The Sony CLM-V55 is pretty expensive, especially if you buy a battery for it, (there is no battery included). You can get a cheap laptop for the price of those items, but a laptop is not very handy, and cheap laptops have awful screens. If you don't use a tripod much or shoot video, it doesn't make much sense to get this. But....if you do use a tripod often for indoor photography, or shoot a lot of videos, this monitor is very addictive. I've whipped up a quick review of the X-rite Color Checker. This little chart is handy if you want to get your picture colors close to what they were at the scene originally, and have no white references to go by inside the image, like wall switches, towels or trim mouldings etc. I use the color checker in addition to visually evaluating the color of each final image I present to a client, because I have the time to do this, and I set the proper white balance at the scene, so I know I've got the colors close at the time of capture. For cheapskates and amateurs; use a white piece of paper and shoot in RAW, and eyeball the final color, that's all you need to do, and it usually works great. Do note; if you shoot in jpeg and mess up the colors at the location, you probably won't be able to fully correct color problems. Most people (and cameras in auto WB) shoot low-light incandescent lighting too warm, and you wind up with a yellow or orange picture. In jpeg, you can usually balance the colors in post processing to get them to be more accurate, but if you're off too far, you've blown the image, that's why it's wise to shoot in RAW. If you're doing technical work, studio photography or producing large amounts of images that need consistent, and accurate colors, with automation, you can check out some color management applications. I won't cover that here, there's plenty of info available online. I've found the best use of the color checker is to be able to pacify clients that think the color of something in the image isn't quite "right." If you start to talk about white balance, reflectivity or luminance, they don't understand, and think you're trying to cover up poor technique. If you tell them (and show them) that you used a color checker, they won't argue, because they don't know how it ties in with the final image, but it looks professional. Doing this is not cheating, or short changing the client, you're simply showing them you did check the colors, and know how to read the chart, and compensate to make sure the colors in the final image are as accurate as possible. I can do a good job by eye if I have a reference, but that's not something I can show the client. Read more here. I'm now working on the Sigma 50mm F/1.4 HSM lens review, so far it looks like I got a copy that passes my own quality control standards, (way to go Sigma), and things are proceeding nicely. I'll whip up a comparison with the Sony 50mm F/1.4 to see what the differences are, as long as I have both lenses on hand. 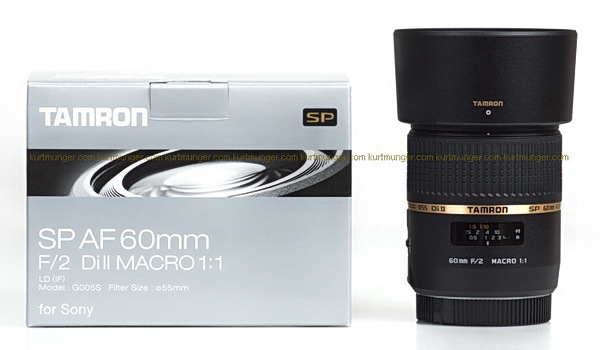 Tamron 60mm F/2 Di II macro review ready! The APS-C only Tamron 60mm F/2 macro lens turned in a good review, although as a macro lens it has some surprising qualities. If you want a pocketable, fast medium telephoto lens for hand-held available light shooting, this is your lens, it works very well at F/2! Also look very closely at this lens if you want razor sharp macro images using apertures from F/5.6-8. If you're looking to do product photography where smaller apertures are normally used, I'd look elsewhere, like the Sony 100mm F/2.8. Check out the full Tamron 60mm F/2 review for more info. My copy has less-than-adequate focusing accuracy, but I may have received one which slipped by the QC boy, which is unusual for Tamron. I've reviewed about half a dozen Tamron lenses as of this review, and never had a problem before. People are reporting few if any problems with focusing accuracy, but do complain about slow focusing. Get Mom something other than flowers or a boring card for Mother's day! Sony still has some deals going on through mid-month, must be they didn't get hit as hard as Canon and Nikon by the quake. If you'd like to get Mom a new camera for Mother's day, the A55 would be a good choice, with the kit 18-55mm lens. If you already have a Sony camera and want to take advantage of the gift, and add a couple of lenses to your own bag, check out the combo specials with the A55 (or A580) and 55-200mm or 75-300mm lenses, which are $100 off with the camera. If you want to buy this camera for your Mom and then permanently "borrow" it as an upgrade to your own Sony equipment, and already have the lenses above, look carefully at the Sony 35/1.8, or Tamron 17-50mm F/2.8; both are excellent in both quality and price. The March homepage news has been moved to the archives. For some reason, B&H photo keeps changing the price of the ad below, it goes from $849.99 - $799.99, all in the last hour (4am EST), I've changed the image three times now, so if you click the image and get a higher or lower price, it's not my bad link! Sony A55 deal for Mom. Make sure you get (and keep) the details in your Real Estate picture. Here's another installment of the Sony A700, and Sigma 10-20mm lens picture chronicles. A Realtor called and asked if I'd take a quick shot of a living-room in an expensive home that was already up for sale. In this case, she took her own shots (one shown below), and was unhappy with a couple of them. 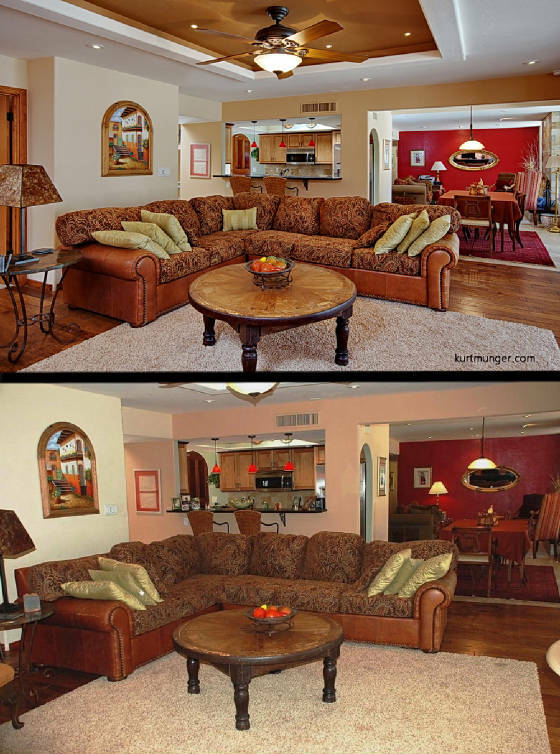 Actually, her living-room shot is pretty good for a Realtor, but it omits an important detail, and has a few other problems that are easy to fix with the right software, although most people don't notice them until you point them out. When you take pictures of architecture, interiors or Real estate, you need to show the interesting details. You might notice the Realtor's shot omits the tray ceiling with fan and recessed lighting, it's mostly because the shot was taken with the camera pointed down at the couch, instead of level, or taken vertically, which is what I would've done if I couldn't get it in the shot horizontally. It looks like the Realtor used the pop-up flash, which is good, but that doesn't illuminate the other rooms that are inside the image. Also, since the camera is pointed down, the walls appear to be falling over near the image edges. One other problem is the color is off, I'm not sure what happened here, but a good guess is the camera was used in AUTO mode in a relatively dark room, and automatically raised the ISO so much that color noise is being reduced, and causing the colors to be dull, and the detail is soft from excessive smearing, again, from high ISO use. My version of this shot uses plenty of outdoor light from big windows to the right, plus three flashes; one, (with umbrella) placed to the left of the camera and pointed towards the center, see the shadows from the coffee table legs; another hidden at the left of the kitchen using an umbrella, and pointed to sweep down the center aisle (to the right) and hidden behind the wall (with the pink matted picture); and finally, a flash in the back family room, hidden behind the kitchen wall and bounced up at the ceiling/wall joint and reflected back to the right far corner of the room. I dragged the shutter (extended the shutter time) to use more ambient light, which helps properly illuminate the other rooms. If there were windows included inside the image, I wouldn't be able to do that, and would've had to use more flashes and a faster shutter speed to properly light each room, so the windows wouldn't be blown out. A couple of small things I did was to de-clutter the kitchen breakfast bar, which make that part of the picture less "busy," and I slightly re-arranged the knick knacks and pillows so the tags don't show! As I said at the top, this was a quick job; I took this shot and a couple of others, and spent about 20 minutes in the house total. In the end, the Realtor was happy and I picked up enough money for a nice Sunday dinner for two! I don't have the image specs, but I think I used about 16mm (24mm equiv) F/7.1, approx. 1/10 sec at ISO 200.